This beautiful intricate Brocade Lace Edger measures 4" wide x 2" deep. Adds a touch of vintage elegance to your cards. This set of 19 dies should really be called Numbers and Symbols..... because besides the digits 0 through 9, you also get brackets, question mark, exclamation point, # sign, @ symbol, ampersand, plus sign, and a heart. Use this set in conjunction with the Brooklyn Alphabet (FRA10415) for truely endless creative possibilities. Create custom birthday cards, I heart you cards, on-trend hashtag cards with custom words (#LOVE for instance), and much more. Frantic Stamper Precision Dies are made in the USA and will work with most leading table-top consumer die cutting machines. 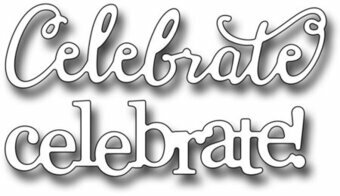 One can never have too many "Happy Birthday" dies (or stamps).... so here's another. I love mixing and matching fonts, so this time, we created a brush script set. The words are individual dies allowing you to place them as you wish. Happy measures 2.1" x 1.125", and Birthday measures 2.875" x 1.125". Our Frantic Stamper Precision Dies work in most consumer table top die cutting machines such as the Cuttlebug, Big Shot, vagabond, Boss Cut, and Grand Calibur. A sweet little hello sentiment die measuring 1.6" x 1". Perfect for a simple card. Our Frantic Stamper Precision Dies work in most consumer table top die cutting machines such as the Cuttlebug, Big Shot, vagabond, Boss Cut, and Grand Calibur. This elegant brush script die is perfect for using on scrapbook pages, or adorning a photo. The sentiment says it all. The word "Sweet" measures 1.75" x 0.75", and the word "Baby" measures 1.75" x 1.2". Our Frantic Stamper Precision Dies work in most consumer table top die cutting machines such as the Cuttlebug, Big Shot, Vaggabond, Boss Cut, and Grand Calibur. Some dies may require the use of a metal shim depending on your machine. The Cascading Hearts die features a cluster of different sized hearts, some open and some solid. 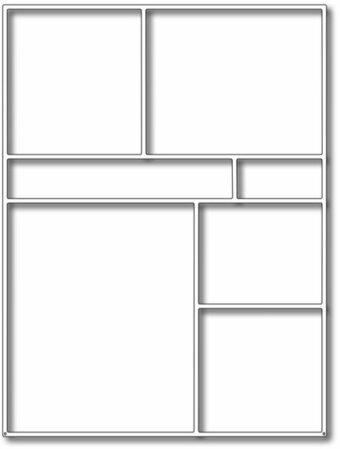 The entire design measures 1.75" x 3.5". As a bonus, when you cut this die, you will get 17 little hearts of varying sizes to use as confetti! Two little words are better than one. With this set, we give you a choice of a script font (2.5" x 0.75") and a block font (2.375" x 0.625") for the price of one! Our Frantic Stamper Precision Dies work in most consumer table top die cutting machines such as the Cuttlebug, Big Shot, vagabond, Boss Cut, and Grand Calibur. Rah! Rah! Sis-boom-bah! Our cheer leader die is ready to get the crowd going! She measures 2.5" x 3.5". GO TEAM!! Frantic Stamper Precision Dies are made in the USA and will work with most leading table-top consumer die cutting machines. 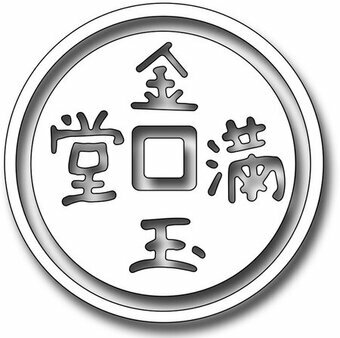 This large (2.25") ancient Chinese Coin die cuts out the coin in several pieces to reassemble for dimension...just add 3d foam pads. Use different colours of paper to make it unique and to suit your colour scheme! This fun "Chrsitmas Words" card panel will create a fast background. The die measures 5" x 3.75", leaving you a nice 1/4" border on a standard A2 sized card. You can choose to color the words, or leave the entire panel one color for a tone-on-tone effect. The chrysanthemum flower has long been used to represent royalty in Asian cultures, but also refects friendship and well wishes. 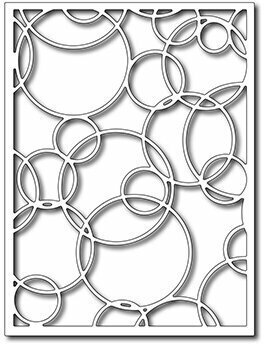 This dainty card panel measures 4.8" x 3.625" and is set in a notched corner rectangle for added interest. Adding dimension to the flowers can easily be accomplished by snipping extra blossoms from the frame and mounting them with foam tape. The Circus Monkey die set features a darling little monkey measuring 1.7" x 2", his unicycle measuring 1.625" x 2.4", a small ball, and juggling club. Two juicy citrus slices for all your summer refreshment needs. Make them into lemons, limes or oranges as you wish! The full slice measures 2.125" in diameter. The half slice is 2.125" x 1.05". The contemporary floral border measures approximately 5.5" x 1.875". The flowers match the Contemporary Flowers die set (FRA10407), so you can layer them for added depth. This fresh modern design lends itself to fun and vibrant coloring, as well as softer muted styles. Our Frantic Stamper Precision Dies work in most consumer table top die cutting machines. Some dies may require the use of a metal shim depending on your machine. This lovely corner floral design comes with 4 additional flowers to layer and achieve dimensional results. The corner design measures 2.5" x 2.625", and the largest individual flower is 1.125". Our Frantic Stamper Precision Dies work in most consumer table top die cutting machines such as the Cuttlebug, Big Shot, Vaggabond, Boss Cut, and Grand Calibur. Some dies may require the use of a metal shim depending on your machine. The Cradle and Mobile die set matches in size perfectly with our Rocking Chair die (FRA10135) and Small Dresser die (FRA10136) to create a complete baby's room. The cradle measures 2.2" x 2.4" and the mobile measures 0.75" x 1.2". Our Frantic Stamper Precision Dies work in most consumer table top die cutting machines such as the Cuttlebug, Big Shot, Vaggabond, Boss Cut, and Grand Calibur. Some dies may require the use of a metal shim depending on your machine. This darling little mermaid is swimming by to say hi. She measures 2" x 2.25". 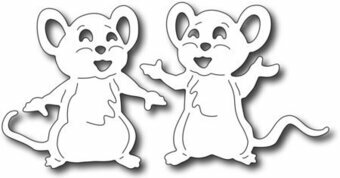 This set of 2 sweet mice are perfectly sized to match the Birthday Icons die (FRA-DIE-09777) and positioned to hold balloons, gifts and more. Sizes:1.75" x 1.75" and 2" x 1.75". Funky cute, this cutlery set includes a 1.6" x 0.75" cutting board, and 3 knives each measuring 1.25" long. Frantic Stamper Precision Dies are made in the USA and will work with most leading table-top consumer die cutting machines. Dagmar the Dachshund is a multi-part die set allowing your to customize your little weiner-dog to your liking. The dog measures 2.375" x 1.625", and the set includes a scarf, coat, harness and leash to dress him up. Frantic Stamper Precision Die - Dangling Stars. The Dangling Stars die cuts little stitched lines and rever-se cuts the stars. This die can make a fun shaker card, or replace the stars with others cut from different colored cardstock. The die measures 5" x 3.5". Idea: Create a sweet baby announcement by cutting the die from white cardstock, and placing pastel stars back in. Add the baby's information below. Our Frantic Stamper Precision Dies work in most consumer table top die cutting machines such as the Cuttlebug, Big Shot, vagabond, Boss Cut, and Grand Calibur. Some dies may require the use of a metal shim depending on your machine. Set of 4 nested dies you will need to snip apart to use. Create frames and card layers with a ragged edge. Sizes are 3.25", 2.5", 1.75", and 1". Our Frantic Stamper Precision Dies work in most consumer table top die cutting machines such as the Cuttlebug, Big Shot, Vaggabond, Boss Cut, and Grand Calibur. Some dies may require the use of a metal shim depending on your machine. Set of 4 nested dies you will need to snip apart to use. 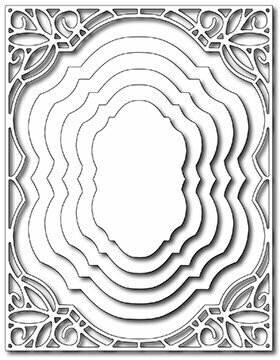 Create frames and card layers with a ragged edge. Sizes are 3"x4", 2.25"x3", 1.5"x2", and 0.75"x1". Our Frantic Stamper Precision Dies work in most consumer table top die cutting machines such as the Cuttlebug, Big Shot, Vaggabond, Boss Cut, and Grand Calibur. Some dies may require the use of a metal shim depending on your machine. Set of 5 nested dies you will need to snip apart to use. Create frames and card layers with a ragged edge. Sizes are 3.75"x5", 3"x4.25", 2.25"x3.5", 1.5"x2.75", and 0.75"x2". Our Frantic Stamper Precision Dies work in most consumer table top die cutting machines such as the Cuttlebug, Big Shot, Vaggabond, Boss Cut, and Grand Calibur. Some dies may require the use of a metal shim depending on your machine. 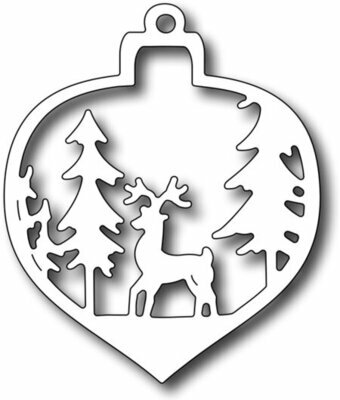 A very trendy look right now is the deer mount, adorned with greenery, poinsettias, fall leaves, etc. Add a simple sentiment for a quick and elegant card. This die is also good for masculine cards. 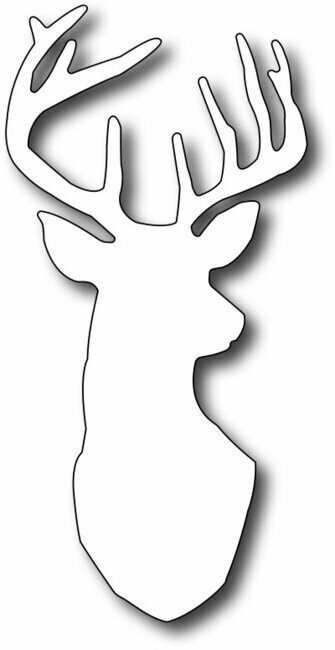 The deer bust measures 1.375" x 2.8". This delicious cupcake can be assembled to create many looks with the icing, sprinkles, 2 different tops and a candle. Mix and match with some of the elements from the Ice-Cream Cone (FRA9462) and Banana Split (FRA9463) sets for even more design possibilities. Assembled size (depending on features used) is approx. 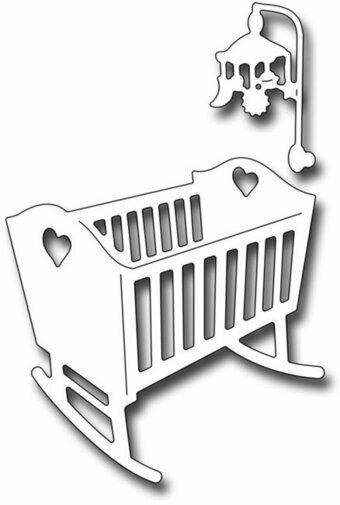 2" x 3.125"
Create a card-sized dresser, complete with accessories to welcome a little one. The finished dresser measures 3.875" x 4.75". 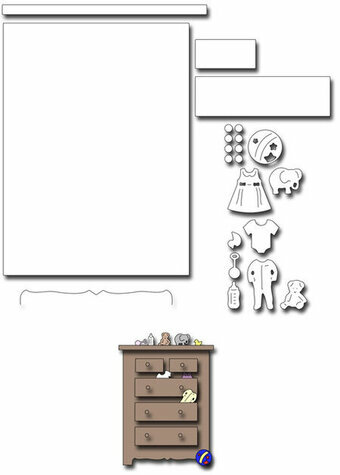 Included in this die set are small clothing, a teddy bear, ball and toy elephant as well as the pieces needed to complete the dresser in many configurations (2 drawer sizes, top, deco cut-out which can be used to create a filigree bottom or top, knobs, etc) Please refer to card samples for assembly ideas. Our Frantic Stamper Precision Dies work in most consumer table top die cutting machines such as the Cuttlebug, Big Shot, Vaggabond, Boss Cut, and Grand Calibur. Some dies may require the use of a metal shim depending on your machine. This set of 5 cat dies features a cat for every mood. The largest (paws out front stretching and curly tail) measures 1.125" x 2". The cats were named for Kathy's kitties, just for fun! Made in the USA with 100% stainless steel. Our Frantic Stamper Precision Dies work in most consumer table top die cutting machines such as the Cuttlebug, Big Shot, Vaggabond, Boss Cut, and Grand Calibur. Some dies may require the use of a metal shim depending on your machine. This set of three large ancient Egyptian icons includes the Scarab (2.5" x 2.5"), Horus falcon (2.25" x 2.1") and Ankh (1.2" x 2.2"). Our Frantic Stamper Precision Dies work in most consumer table top die cutting machines such as the Cuttlebug, Big Shot, vagabond, Boss Cut, and Grand Calibur. Some dies may require the use of a metal shim depending on your machine. The Egyptian Sarcophagus die measures 1" x 2.5". Our Frantic Stamper Precision Dies work in most consumer table top die cutting machines such as the Cuttlebug, Big Shot, vagabond, Boss Cut, and Grand Calibur. Some dies may require the use of a metal shim depending on your machine. 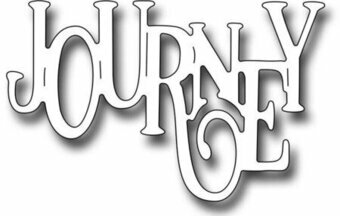 The "Journey" word is done in our "elegant" font, which matches many of our previously released word dies, and more to come soon. The die measures 2.85" x 1.5". Perfect for travel cards and scrapbook pages as well. Our Frantic Stamper Precision Dies work in most consumer table top die cutting machines such as the Cuttlebug, Big Shot, vagabond, Boss Cut, and Grand Calibur. Some dies may require the use of a metal shim depending on your machine. Everybody needs a little bit of kindness in their life. We love the elegant font we've used for quite a few of our word dies. Kindness measures 2.55" x 1". 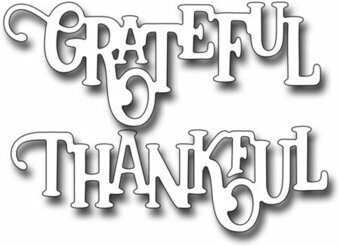 Frantic Stamper Precision Die - Elegant Thankful. The Elegant Thankful die set contains two word dies, perfect for the fall season, and for expressing gratitude. The "Thankful" word measures 3" x 1", while the "Grateful" word measures 3" x 1.125". If you like the style of this die set, you may also like our Elegant Blessings die set (FRA10280). Our Frantic Stamper Precision Dies work in most consumer table top die cutting machines such as the Cuttlebug, Big Shot, vagabond, Boss Cut, and Grand Calibur. Some dies may require the use of a metal shim depending on your machine. What girl doesn't like a diamond ring? This die measures 1.25" x 1.625". The design can easily be altered to create a plain wedding band by cutting off the diamond with scissors. You look fabulous!! This word die measures 2.75" x 0.875". Our Frantic Stamper Precision Dies work in most consumer table top die cutting machines such as the Cuttlebug, Big Shot, Vaggabond, Boss Cut, and Grand Calibur. Some dies may require the use of a metal shim depending on your machine.